What does “Stop Out Level” or “Stop Out” mean? The Stop Out Level is similar to the Margin Call Level, that was covered in the previous lesson, except that it’s much worse! In forex trading, a Stop Out Level is when your Margin Level falls to a specific percentage (%) level in which one or all of your open positions are closed automatically (“liquidated”) by your broker. This liquidation happens because the trading account can no longer support the open positions due to lack of margin. More specifically, the Stop Out Level is when the Equity is lower than a specific percentage of your Used Margin. 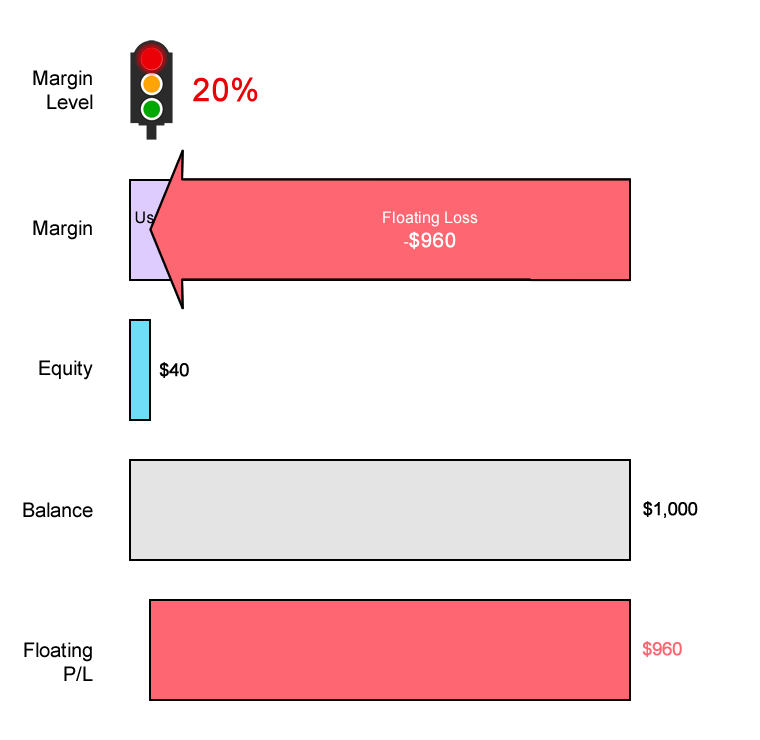 If this level is reached, your broker will automatically start closing out your trades starting with the most unprofitable one until your Margin Level is back above the Stop Out Level. If your Margin Level is at or below the Stop Out Level, the broker will close any or all of your open positions as quickly as possible in order to protect you from possibly incurring further losses. This act of closing your positions is called a Stop Out. Keep in mind that a Stop Out is not discretionary. Once the liquidation process has started, it is usually not possible to stop it since the process is automated. Your broker’s customer support team will probably NOT be able to help you aside from lending an ear while you weep loudly over the phone. The Stop Out Level is also known as the Margin Closeout Value, Liquidation Margin, or Minimum Required Margin. Let’s say your forex broker has a Stop Out Level at 20%. This means that your trading platform will automatically close your position if your Margin Level reaches 20%. 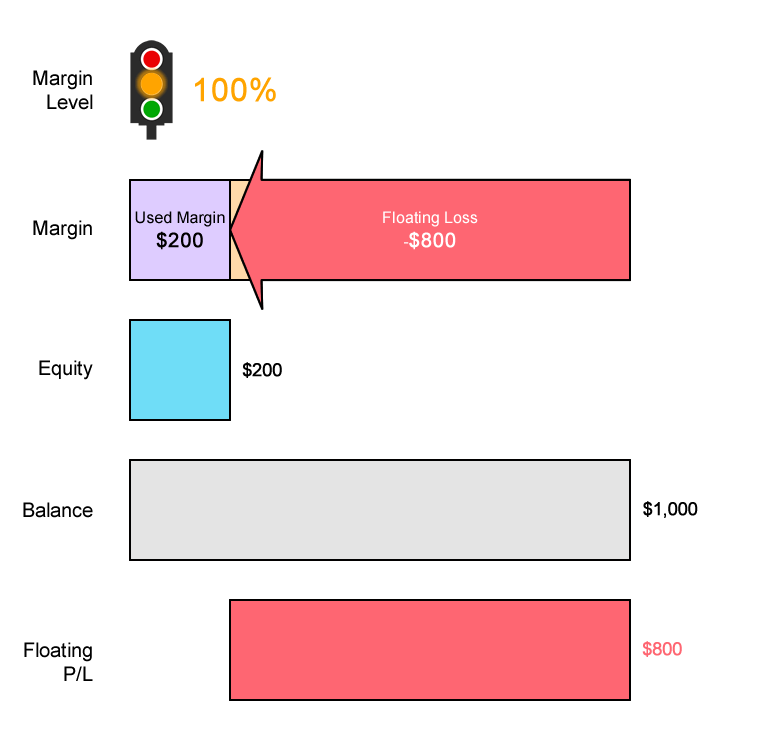 Let’s continue with the example from the previous lesson, What is a Margin Call Level? You’ve already received a Margin Call when the Margin Level had reached 100% but still decide not to deposit more funds because you think the market will turn. Not only are you a sucky trader, but you’re a crazy trader also. A sucky crazy trader. Anyways, your sucky crazy self ends up…absolutely WRONG. The market continues to fall. At $1/pip, you now have a floating loss of $960! This means your Equity is now $40. Your Margin Level is now 20%. At this point, your position will be automatically closed (“liquidated”). When your position is closed, the Used Margin that was “locked up” will be released. It will become Free Margin. The end result for you will be depressing though. Your floating loss of $960 will be “realized”, and your new Balance will be $40! Since you don’t have any open trades, your Equity and Free Margin will also be $40. If you had multiple positions open, the broker usually closes the least profitable position first. Each position that is closed “releases” Used Margin, which increases your Margin Level. But if closing this position is still not enough to get back the Margin Level above 20%, your broker will continue to close positions until it does. 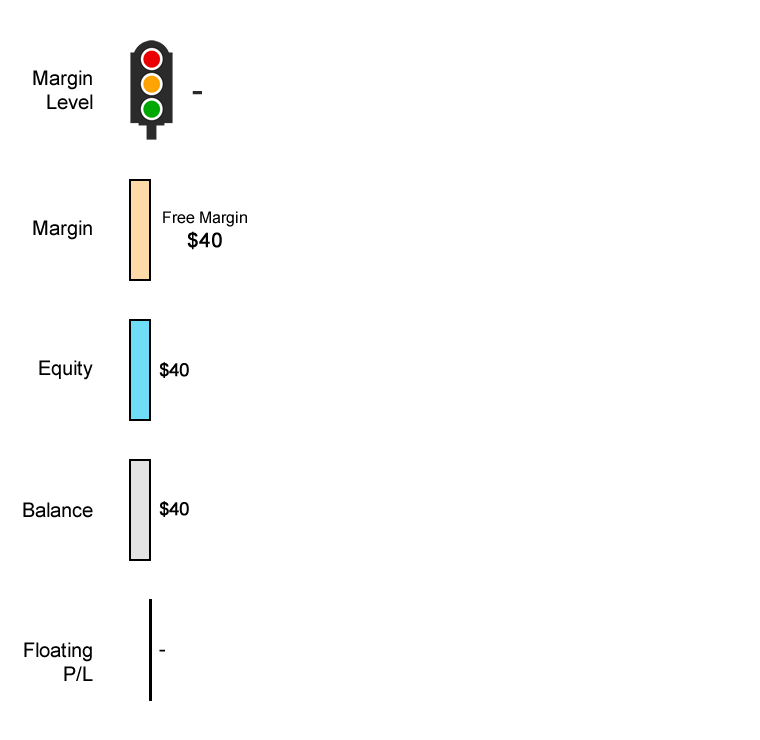 The Stop Out Level is meant to prevent you from losing more money than you have deposited. If your trade continued to keep losing, eventually, you’d have no more money in your account and you’d end up with a negative account balance! Brokers would prefer not to have to come knocking on your door with a baseball bat to collect the unpaid balance, so a Stop Out is meant to try and… STOP… your Balance from going negative. Now that we’ve covered all the important metrics that you need to know in your trading platform, let’s take everything you’ve learned so far about margin trading and put it all together using different trading scenarios.